Many chess players have no doubt seen The Luzhin Defence, a movie based off the novel (of the same name) by Vladimir Nabokov. In viewing this movie, one cannot help but to feel empathy for the main character Alexander Ivanovich Luzhin, an eccentric Russian Grandmaster played credibly by John Turturro. As a young boy, Luzhin lived a life of privilege, but also one filled with contradictions and personal challenges. He had one escape from the confusion that swirled around his life… chess. John Turturro as "Alexander Luzhin"
Set in the 1920s era, Luzhin travels to Italy to compete in a top tournament billed as the equivalence of the World Championship. He meets a woman named Natalia Kutkov (played by Emily Watson) with whom he falls in love and to whom he proposes marriage. The entire story would unfold and a number of personal challenges beset a troubled Luzhin: memories of a neglectful childhood, Natalia's mother's opposition to the proposal and an exploitive acquaintance from the past. One of the most intense moments came when Luzhin faced Dottore Turati, an Italian Grandmaster played by Fabio Sartor. Both had won their respective groups and would face off in the grand finalé… the winner would be the World Champion. 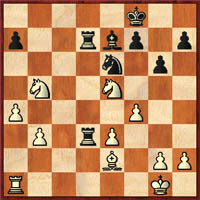 The game started off 1.Nf3 d5 and after a positional battle, both players got into intense time pressure. The Dutch director Marleen Gorris was able to catch the emotions of the two players and some very interesting board angles. In the time scramble, the position in diagram #1 occurred. Turati had just played Ne5 and had the advantage. Both players had a couple minutes left and were feverishly blitzing out moves. The game continued 37… Rd2 38.Nxd7+ Rxd7 39.Kf2 Bc5 (threatening Nxf4) 40.Kf3. Luzhin paused, blitzed out 40… Re7 and pounded the clock. Turati played 41.Rc1 followed by Luzhin's 41…a6!? After 42.Nc3 Luzhin maniacally slammed 42...Nxf4!? 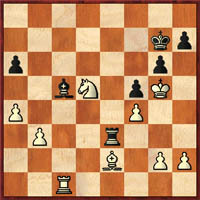 on the board after which Turati played 43.exf4 (diagram #2). 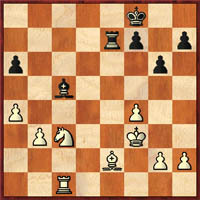 As Luzhin calculated the position, variations flashed about the board. Luzhin seemed to be searching for something more than a move… perhaps answers to his life. While at the board, Luzhin had an epiphany of his deceased parents and his beloved aunt. 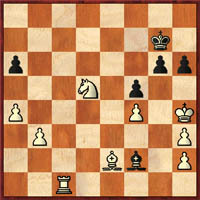 During these visions, Luzhin lost track of the game and his flag fell before his 43rd move (diagram #2). They would adjourn the game and play the secondary time control the next day. Spectators could be heard saying that Luzhin's position was practically hopeless. What would happen next is sheer tragedy. After suffering a complete breakdown, being told never to play chess again, and later being detoured from his wedding, Luzhin lost himself and leaped from a window to "escape" from the troubled past. Now with Luzhin dead, there would be no completion of the match. While searching Luzhin's suit coat, wife Natalia found his adjourned moves. After realizing what she had found, Natalia contacted the tournament officials and requested to play the moves posthumously for her husband. Natalia entered the hall with a demure and confident look. She took her seat and the game continued, 43… Re3+ (sealed move) 44.Kg4 f5+ 45.Kg5 Kg7! (threatening Be7 mate) 46.Nd5 (diagram #3). Using the sheet of paper with "Luzhin's Defence," Natalia picked up the rook, played 46…Rh3!! and looked at Turati before releasing the piece. After 47.gxh3 (else 47…h6 is checkmate), Black triumphed with 47…h6+ 48.Kh4 Bf2 mate!! (diagram #4) This is what Luzhin was so happy about only moments before his initial emotional breakdown. A satisfying ending! The movie is one a chess player can certainly appreciate and is crafted for a mature audience. The chess scenes were realistic (thanks to the film's chess advisor English GM Jonathan Speelman) and the movie set captured the 1920s prestige of the chess circuit. Some viewers have even noted a resemblance to Alekhine-Capablanca, but one thing is certain the movie is just as much a lesson in triumph in values as it is triumph over the chess board. 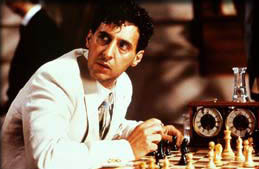 Other chess movies such as "Fresh" and "Searching for Bobby Fischer" have similar characteristics. "The Luzhin Defense" is certainly worth seeing as mere words cannot even begin to capture its resplendent craftsmanship. Well done!